This is definitely a different take on the old shooter genre. 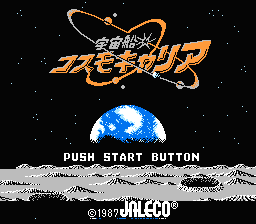 The entire game is menu-based. You warp around from planet to planet, looking for aliens hell-bent on destroying the solar system. 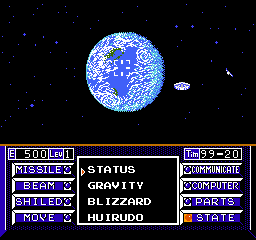 You put a cursor over said enemies, choose whether you want to talk, shoot missiles, or fire lasers at them. It’s pretty simple except for the fact that everything still shoots at you while you’re wandering around the menus and waiting for text to display. Sadly, I must say that this isn’t exactly the most fun game ever. Well, this is a good early start. The menus seem English enough for me to deem them navigable, and the system messages are English enough to know what’s going on. There’s a few odd spelling errors and mis-translations, though – but hey, it’s alright. That’s why it’s a beta and not a final release. NOTE: May have issues with the display when running in FCEUX.